I know it has been awhile. It was a wonderful fall season at Silver Dollar City again this year. They are very good to us. The artisans are amazing. And, of course, getting to meet so many of you just makes me beyond happy! November and December just flew by and I can't believe it is the middle of January - of 2017!! So what's new for 2017? First, I have a new companion. Meet Finnegan Palmer. He was my Christmas present and joined our home the Monday before Christmas. 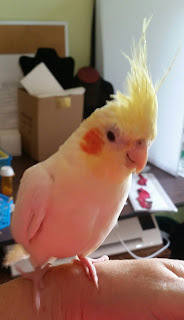 He is now about 7 months old and can live up to 20 years. So he'll be around for some time! 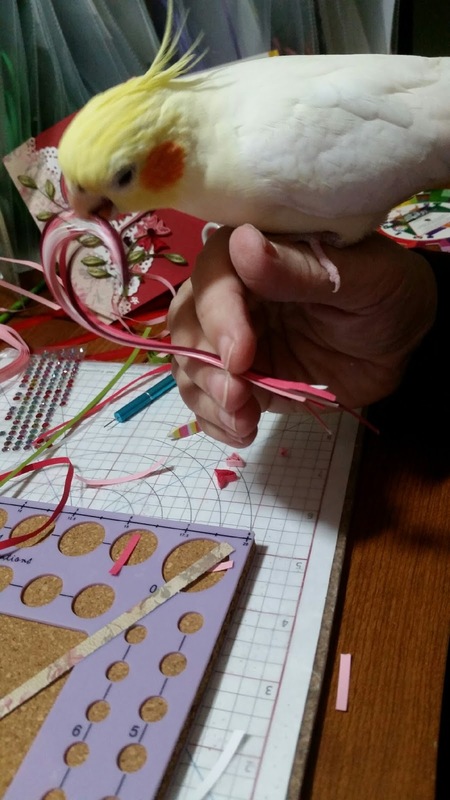 And his favorite color of quilling paper is pink! Anytime I have a pink strip in my hand he heads down my arm to grab it, runs back up my arm, and chews on it! lol He is so funny and keeps me laughing all day. Working on new patterns for my Etsy shop, too! Having only three patterns is just not enough. You all are hungry for great ideas! Here's to no time for boredom in 2017!